The challenge this week is summer. I chose to post a picture of my zinnias. 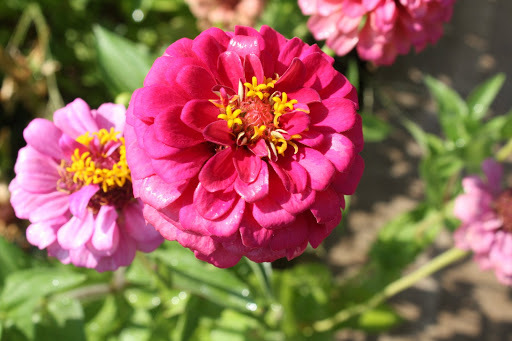 My grandpa used to plant zinnias every year, then would gather the seeds at the end of the season and save them until the next year. My grandma continued this tradition after my grandpa went to be with Jesus. Once Kevin and I had a house, Grandma gave me a bag of seeds to plant. We have planted them for years and collect the seeds as well. A couple of years ago I could NOT find my bag of seeds so we bought some zinnia plants – which, of course, wasn’t the same. In the middle of that summer – I found my seeds!!! So now we are back to the seeds that originally came from my grandpa’s flowers!! It is a fun summer tradition for us. They are beautiful and HUGE! The girls are excited to help gather seeds! Enjoy! !